Spring is such a great time of year. The snow is melting (thank you GOD), the days are getting longer, baby goats are being born, seedlings are sprouting and yes baby chicks and ducks are being brought home. In some cases for the very first time. If you are a first-time chick owner then good for you. 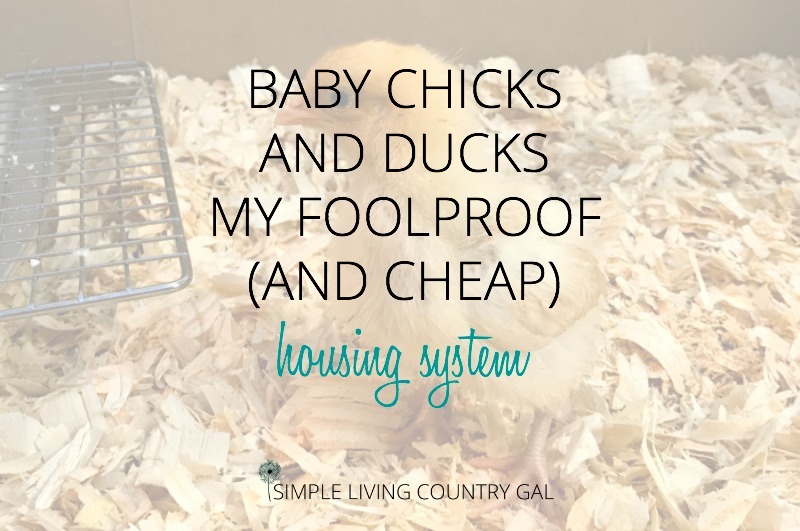 This post is all about getting set up at home so you have a safe place to house your baby chicks until they are ready to go outside into the chicken coop. I have been raising chickens for almost a decade now and I thought I knew just about all I needed to know. Boy, was I ever wrong! This year we decided to do something a little different. We added two adorable little ducklings to our flock of baby chicks. We were told that we could just raise them all together and other than offering a patch of water once they were out in the coop we really didn’t need to do anything different. Besides, how much trouble can two little adorable baby ducklings (whom we lovingly call Thelma and Louise) cause? Well, let me just jump in here and say that what we were told was completely wrong and our baby chick system was about to be thrown on its ear. Normally I just keep all my little chicks in a large box using our plastic waterer and feeder found on Amazon. Baby chicks are delicate dainty creatures that sip their water and nibble their food. Ducklings on the other hand (and I say this with love) are clutzy and clumsy and dive into their food and water as if they have not had either in weeks. That box I had planned on using the entire 2 months my chicks are indoors only lasted 1-week thanks to Thelma and Louise. I needed to come up with a new box and a new system that would outlast the antics of two crazy ducklings. If I have not said it before, Hubs is my hero and more often than not when I ask for the impossible he pulls through with amazing speed. In this case, I asked for a bigger box with lower sides so I could get in and out easier. That night he brought me home this box that was PERFECT! 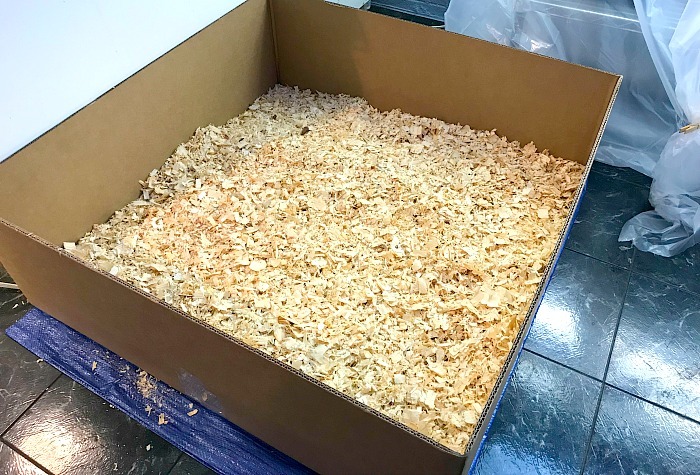 I filled it with a fresh layer of wood shavings and put it onto a tarp to protect the floor. Next, I needed to find a way to water the crew without the ducks being able to spray water all over the entire box. Off to Pinterest I went and found this clever idea. 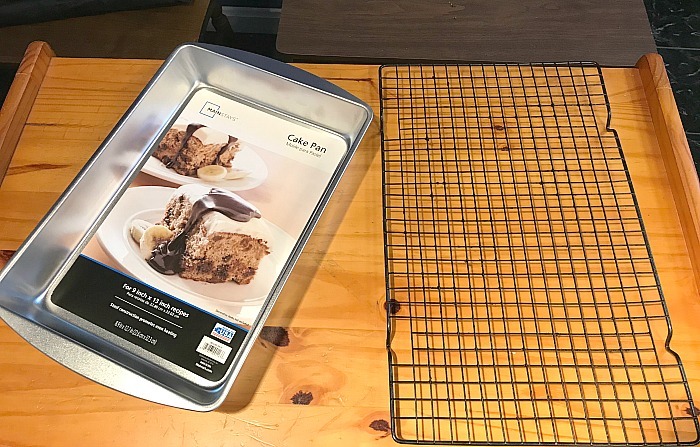 I was so in love with this idea I immediately ran off to the store to get a couple of super cheap cake pans and cookie racks. 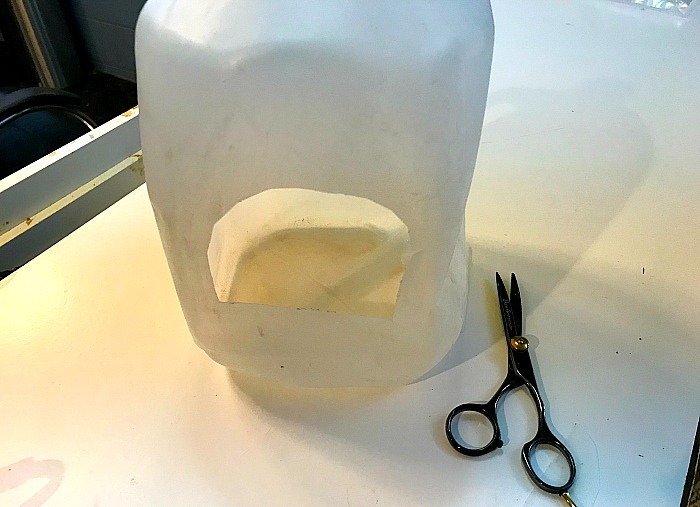 Next, I took a cleaned and empty milk jug and cut my ever so neat and perfectly even windows. One on each side. I placed the brownie tray in the box moving bedding around so everything sat even. Once that was done I placed the rack on top. . Make sure you purchase a rack with small holes so the chicks will not get their feet stuck. I had a few small sheets of plexiglass that I put behind the tray just to make sure I protected the box from ducks spraying water all over. Once I had everything set up to my liking I filled the jug with water and place it on top of the rack. I decided to do the same thing on the other side of the box with the feeders. 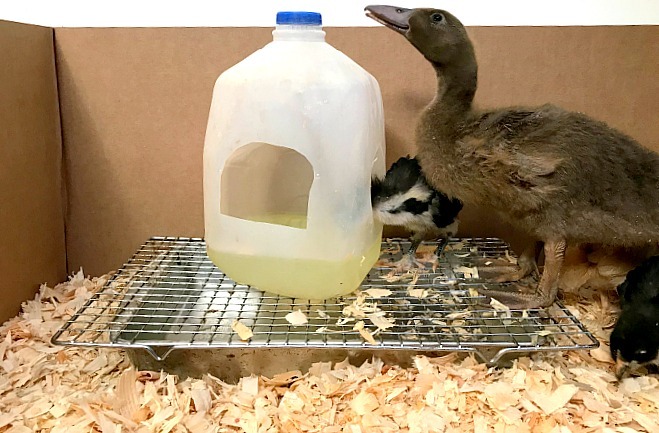 My ducklings throw feed just as much as they throw water and by using this same system I am able to keep feed loss to a minimum. I chose to keep the tops off of the feeders since my ducklings are so big already at 10 days and tend to bump into the top part. This just means I need to feed them more often but that is not a problem at all. As you can see in the photo above the baby chicks (which are still relatively small) can easily walk on the grate without falling in or tripping. If you can stick your finger in easily chances are the holes are too big for your baby chicks. Next, we added the rest of the gang and gave them time to get used to their new surroundings. It took a bit for everyone to find the water. I need to do a couple of beak dips to get the ball rolling. A beak dip is when you gently dip your chick’s beak into the water. This shows them where it is and makes it easier for them to find it. More often than not I only need to do this with one or two chicks. As they go up to drink the others follow suit and within a few minutes all the chicks found the water. The feed set up was much easier for them to find since I did nothing new other than placing it up on the grate. They were able to smell the feed and begin eating right away. The final step was to get the heat lamps set up and at a good height. Remember you need to keep the temperature at a solid 95 degrees the first 2 weeks. After you will want to decrease the temp by 5 degrees every week until the temp matches yours outside. 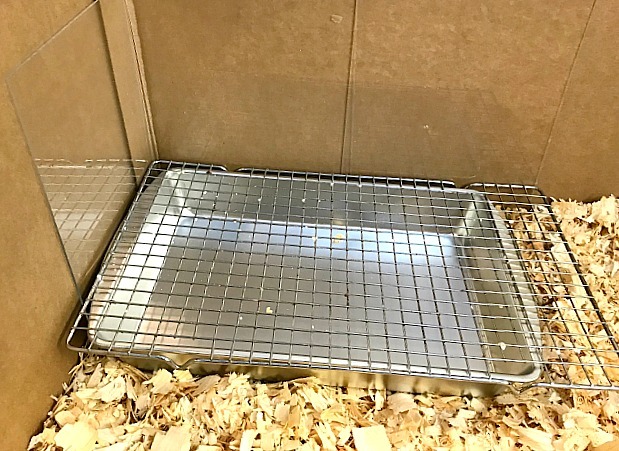 Once your chicks and ducklings are acclimated to the outside temperature and are at a size you feel comfortable with you can move them out to the coop. Please be very VERY careful when using heat lamps. 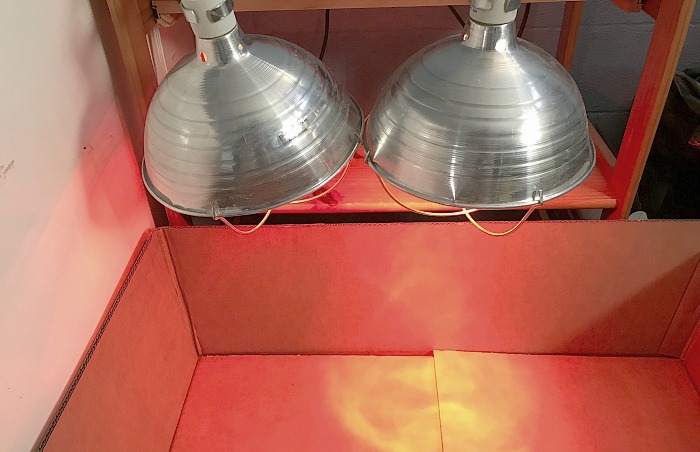 Heat lamps are hot and will start a fire almost instantly if they are too close to something flammable or if they fall into something flammable. Make sure your heat lamps are solid, secure, and anchored. This is your baby chicks set up. Having a sturdy system in place will make caring for your chicks and ducklings much easier to do. I do have a word of caution. Baby chicks are extremely dusty. I can not even begin to tell you how much dust these birds make. 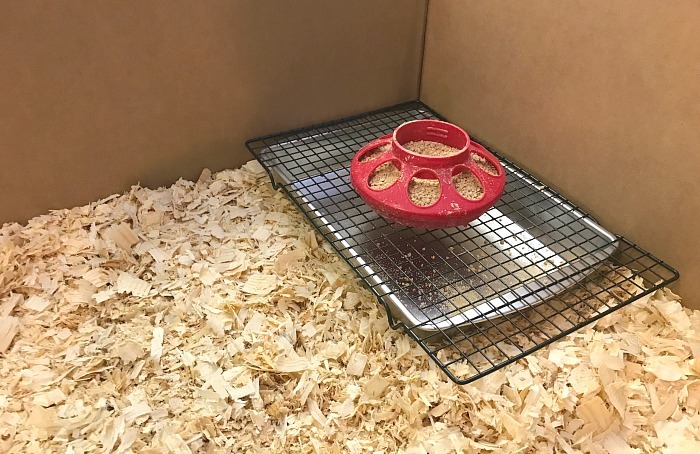 For that reason, you will want to keep your chicks in an area that will not cause a big mess and an even bigger headache to deal with. 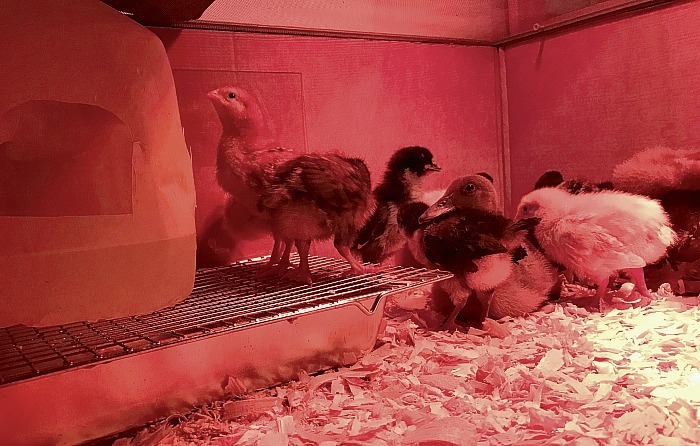 We keep our chicks in the basement so our home is not affected as much. Just keep this in mind when picking a spot for your chicks. When you have your chicks acclimated to the outside temperature and you feel they are old enough it is time to move them out to the coop. As long as you have a coop that is safe and secure your hens and ducks will be just fine outside. Ninja Tip: If you are adding chicks in with older hens you will want to make sure your chicks are close to full grown. New chickens will be bullied and/or henpecked to a point that can cause serious injury. Be sure your new chickens are large enough to defend themselves. Ninja Tip 2: The best time to add new chickens to a coop is at night when everyone is sleeping and docile. Simply take your new chickens inside the coop and put them on the roost. Come morning most of the flock will think the new gals were there all along and more often than not leave the newbies alone. Raising baby chicks is not only fun but rewarding too. Knowing what you are in for before you bring that first chick home and having a set up in place that is sturdy is key. 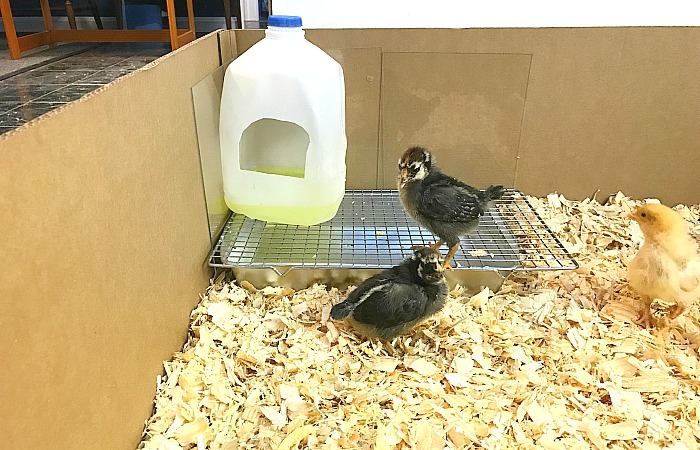 As long as your chicks are safe, have plenty of fresh water, are warm and have access to food your flock will grow into a solid egg laying group that will reward you for years to come. 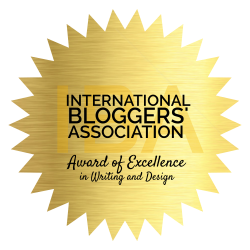 You can find this post and others over at my favorite Blog Hop!! 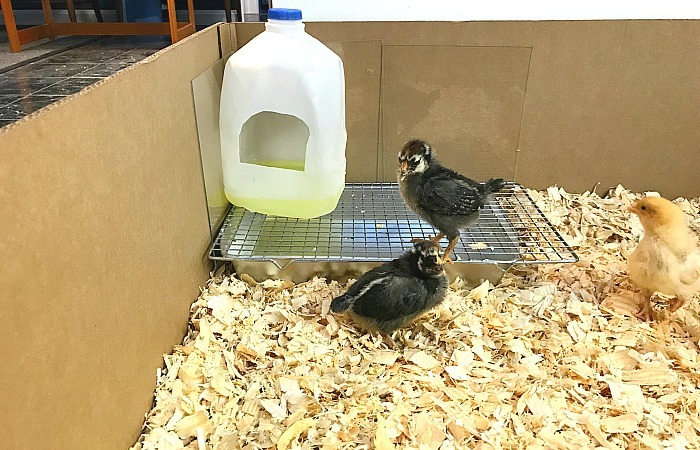 I just got my first chicks a few weeks ago and definitely struggled with finding a safe but cheap option. I did end up splurging for the hover heater cause of the risk with heat lamps. I appreciate the the cake pan and cookie rack! I will definitely try that as they’re putting bedding in their waterer. Thanks for this information. Found you on the blog hop! Yes, no one really warned me how messy chicks can be. And the dust? Oh boy!! Wasn’t prepared for that on at all! Hope this setup helps you as much as it has helped me!